Carbon dioxide and other combustion products are minimized by efficiently using still column vapors to fuel the process and incorporating an improved burner system. The patented Quantum Leap Natural Gas Dehydration Technology eliminates virtually all hydrocarbon emissions and pays for itself by recovering them as valuable fuel products. This new technology also creates a safer working environment, reduces fuel requirements, trims maintenance and operating expenses and super-cleans the glycol, reducing losses and glycol replacement costs. 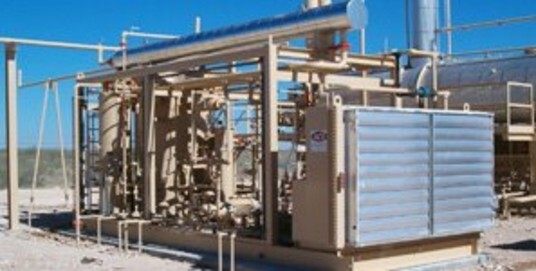 A 1996 EPA report estimates that there are 252,000 gas wells in the United States serviced by 38,000 active dehydrators. The EPA also estimates that these dehydrators collectively emit about 18.6 billion cubic feet (393,000 tons) of methane, 60,000 tons of HAPs, and 142,000 tons of VOCs per year. The QLT process would convert these emissions to usable fuel, equivalent in energy to about 240 million gallons of gasoline. The EPA study further concluded the process effectively eliminated all Volatile Organic Compounds (VOCs) and methane emissions associated with the glycol dehydration process.